ASP.NET provides a ready-to-use infrastructure for managing and using roles. This extensible infrastructure Includes prebuilt functionality for managing roles. You can use it to assign roles to users and to access all the role information from your code. – A provider-based extensible mechanism for including different types of role data stores. – Ready-to-use implementation of a provider for SQL Server and the necessary database tables based on the Membership database. These tables associate membership user entries with roles in a many-to-many relationship and are automatically created when calling the aspnet_regsql.exe tool. Note: If you want to find more information you can use search mechanisms of our site by using word Membership or word Aspnet_regsql. – The prebuilt RolePrincipal class that is automatically initialized for authenticated users through the RoleManagerModule (also included with the roles infrastructure). – Complete programmatic access to the roles through the Roles class. 1. Create the data store either by using aspnet_regsql.exe or by executing the TSQL command scripts included in the .NET Framework directory. 2. 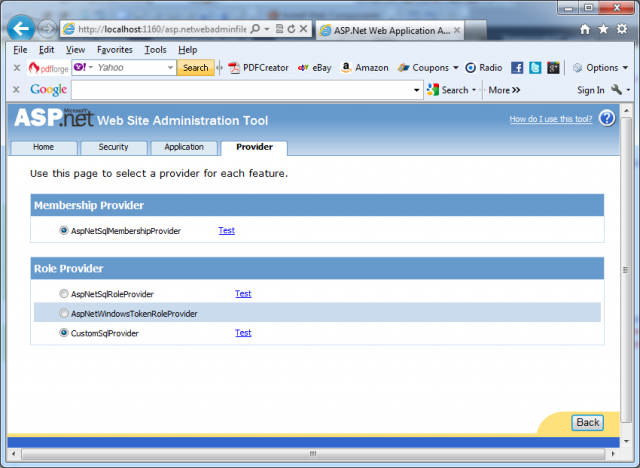 Configure the roles provider to use the previously created custom store. You can use <roleManager> tag to configure the roles provider. You can either use a different database or use a completely different store if you want. You can use the same tag to configure certain properties that can’t be configured in the WAT. As soon as you have added this configuration entry to your web.config file, you can select the provider through the WAT. To do this you have to switch to the Provider tab and then click the link Select a Different Provider for Each Feature.